Having successfully launched the ‘iNotePad’ (a sixty-page paper notepad that looks exactly like Apple’s iPad) Shed is very proud to launch another exciting product through his Nice Pear® brand. 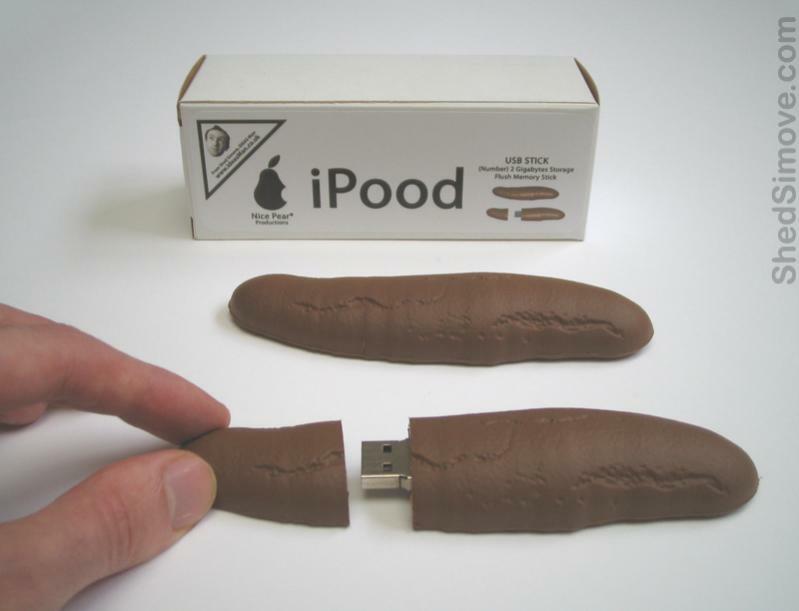 This time it’s a turd-shaped memory stick named the ‘iPood’. The iPood is a TWO GIGABYTE (or in this case, gigashite) fully functional flash memory (or flush memory) stick. It took Shed a long time to get the colours of the final iPood completely right and he had to send Pantone references to the factory in China to get the authentic and realistic final shade – which, if you’re interested (how can you possibly not be? ), is Pantone 4485C. The idea for this groundbreaking new memory stick came when Shed performed a presentation about creativity and innovation for leading brand identity company ELMWOOD. During Shed’s talk, which was delivered to top business experts in the UK, he disclosed his tips for how have great ideas and also showcased some of his products to date. Shed then ran a contest for the VIP audience to think up a new product for Shed to develop and launch. The winning idea came from *Jonny Shrager*, for a concept he entitled ‘Log On’ - a memory stick that looked like a human turd. Shed says, “In the past, some people have kindly said that certain ideas I’ve created are awesome, but I can say with complete certainty that this idea is utter sh*t…and you can quote me on that…”.